When you look at most of the two dozen or so people in this photograph, which belongs to a Canadian museum, there's no doubt that they're from 1940, the year in which it was taken. But what about that guy? Those funky sunglasses? That stamped t-shirt and hippie shawl? The doofy, disinterested expression? He sure as hell doesn't look like any Roosevelt-era bro I have ever seen. Maybe that's just it—he looks like a "bro," which we all know didn't come into existence until the 1970s, at the earliest. Interesting. This is either real, or a pretty good fake. I'd like to see this photo in real life to see if the guy is still in it. If its real he's definetely a time traveller, guys wouldnt be allowed out the house dressed like that. I think its a fake though, based on the fact that he isn't really lookin the same way as everyone else. Its a good photoshop I think. EDIT: which "canadian" musuem is this picture from? Canadian museum sounds supisciously vague to me. wonderboy wrote: he isn't really lookin the same way as everyone else. seems like he is looking at the same thing that the woman in front of him does, isn't he? but he isn't smiling like most of the people in the picture, he is kinda sad even. mack, is there any fact or something you wanna say? or you really believe in "time traveler" thing? Last edited by Amir on Tue Apr 20, 2010 11:18 am, edited 1 time in total. one fact is that 90% of people (you included) will not click more than 1 link away. Ya sneaky russian.... I never seen the source part. I clicked it and it never told me much. Amir, he isn't looking the same way as anyone else. He looks disinterested whereas everyone else is excited and smiling. Mind you though, if he was a time traveller, he would be visiting this point in time for a reason, maybe it was a particularly sad time for his family or something. Who knows, still think its fake though. Last edited by wonderboy on Tue Apr 20, 2010 11:29 am, edited 1 time in total. oops! let me tell you a fact: i didn't notice the SOURCE link!!!! my eyes' resolving power must be in the order of degrees!!! 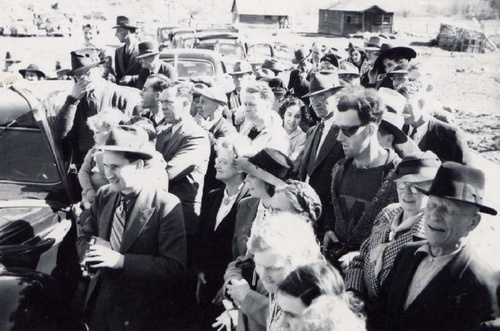 This picture was taken around 1940 at the reopening of the south fork bridge in november 1940. I have just found the photos on the bralorne pioneer museum website and he is still in it in picture 124 of 155.
wonderboy wrote: he isn't looking the same way as anyone else. You can't say they are looking the same way by drwing two lines heading the same direction. You could do the same with the guy in the hat next to our time travelling friend, but of course that would be wrong because due to the direction his face is facing he clearly isn't looking that way. our time travellers head is at a different angle to that of the lady. If you were to be standing directly behind them, you would see that he is looking slightly more to the left of the woman meaning his gaze is going in a completely different direction. Its easy to draw lines on a 2D surface and say they are looking the same way, but if you take a 3D perspective they isn't. What freaks me out a little, is the little girl, she's looking that way as if she knows. Do you think its the time travellers little sister? the lines are just graphically showing what i wrote!! i know i cant make people looking at something by drawing lines! the little girl is just looking at the camera, like any other kid, she's excited for being in a picture. she is too far to be related to our time traveler. But do you agree they are looking in different directions. They cannot possibly be looking at the same thing. Plus the little girl is looking directly at him, and not at the camera, this can be seen in the following image which I do not know how to put within my post. Click on this link http://forgetomori.com/2010/fortean/tim ... eum-photo/ and scroll down a little and you will see a better picture of the girl and where her eyes are aiming. Anyway, I'm starting to get even more suspicious of this photo. I want to see more pictures of this day, and there must be some out there. wonderboy wrote: Anyway, I'm starting to get even more suspicious of this photo. I want to see more pictures of this day, and there must be some out there. The more I look, the more it looks to me like this guy belongs there. Those dark glasses look nothing like what people wear today. Anybody trying to be a little cool wouldn't be caught dead in that sweater. The "modern" appearance is very superficial, and amplified by the very traditional appearance of the other folks. But really, there's nothing inherently out of place with the guy. I think it's a perfectly ordinary photograph with perfectly ordinary people in it. All from the period. Have you looked through the photos on the museum website? Not one person is dressed in anyway similar to the man being referred to in the photo above in any of the museum photos. all of them are wearing suits of some kind, or dressed smartly in shirts. its quite surreal to see him there. if it is real and to date, he must have been the town wierdo. Plus I think he's dressed cool. I would wear what he has on, minus the sunglasses!!!! wonderboy wrote: Have you looked through the photos on the museum website? Not one person is dressed in anyway similar to the man being referred to in the photo above in any of the museum photos. all of them are wearing suits of some kind, or dressed smartly in shirts. its quite surreal to see him there. if it is real and to date, he must have been the town wierdo. Of course- it's the fact that he's dressed differently than everybody else that stands out. But it isn't particularly odd that somebody might look different, even in 1940. What he's wearing isn't out of place for the time, it just clashes with what everybody else in the picture is wearing. I'll bet you could find quite a few images like that. It's just that this one seems to show a person wearing modern clothes. But I think that impression goes away on close examination. If he were really such an oddball or weirdo, you'd think some of the people around him would be showing interest. He certainly isn't attracting any attention. It should be pointed out that what everyone is staring at is the Time Traveler's grandfather whom the Time Traveler had just inadvertently struck with his car. Chris Peterson wrote: The more I look, the more it looks to me like this guy belongs there. Those dark glasses look nothing like what people wear today. Anybody trying to be a little cool wouldn't be caught dead in that sweater. The "modern" appearance is very superficial, and amplified by the very traditional appearance of the other folks. But really, there's nothing inherently out of place with the guy. I think it's a perfectly ordinary photograph with perfectly ordinary people in it. All from the period. Yup. Frankly, I think the dude is European. In any case he's a generation ahead of most everyone else there, and in fact does fit. Now if he had streaked hair or a pointy mohawk I'd be hard pressed to place him. I think our part of the world is not the forerunner in fashion anyway. BTW, is that a camera he's holding or his remote time-machine control? Allegedly a guy was watching Charlie Chaplin's 1928 silent film 'The Circus' and spotted a woman in a scene walking by talking on a cell phone. I agree that this guy belongs there. His glasses look nothing like today's style glasses. The sweater is daring by the standards of the 1940s but simplistic compared with similar shirts today. His hairstyle is really very 1940s - I had a period when I collected old books on sports, and I own a few 1940s books showing pictures of young Swedish 1940s athletes with exactly that kind of hairstyle. The guy belongs, but he sure is a very, very cool guy for his time! Thanks for showing us the picture! I'll buy into the lady time traveller with a cell phone in 1928. Can’t be a cell phone, no phone towers, lousy reception. Besides, who would she be talking to. bystander wrote: Can’t be a cell phone, no phone towers, lousy reception. Besides, who would she be talking to. That might be determined just by reading her lips. much ado is said about him looking in a different direction. Take a good look at the picture; there are more people looking in different directions; like the lady and the gentleman in the background. perfected a communications system that didn't require one to hold a phone to one's ear. "Beam me up after I've seen the movie, Skippy." You have to wonder about the fashion sense of the future. Or else this lady did what Kirk and Spock did when they visited the Earth in the 1930s and stole a couple of outfits from a balcony in order to fit in. This lady was lucky to find a pair of shoes her size, or else they really weren't her size, or else they were, in which case you have to wonder about the size of old ladies' feet in the future. Or else the lady is really Captain Kirk in drag. William Shatner was always a shortie. And the man narrating this video is wearing a Captain Kirk shirt with a print, as you can see.